You are here: Home » Prophecies » His head was a Baphomet! His head was a Baphomet! I saw myself walking into a beautifully ornate church, filled with gold and silver. I saw idols of gold and silver and other costly items. It seemed to be a Tabernacle of beauty. It was so white and seemingly spotless inside. I stopped to look back and this church seemed be stunning in beauty, yet I felt my spirit greatly grieved. As I made my way up the aisle, I saw a figure standing in front of the church between the pulpit and the altar. I did not see his face, but I saw his body and knew he was facing where the congregation would be sitting. Yet, the place was empty and there was no one in there but him and me. Finally, I turned to see who it was standing before the congregation. IT TOOK MY BREATH AWAY and I think I might have literally gasped!! He stood there in a beautiful white robe that flowed down to his ankles. He had the feet of a man and was wearing sandals. As I began to examine him, I was shocked to see he was wearing what appeared to be a priestly garment, like the Old Testament priests, including the breastplate on his chest with the precious stones in it. Then I went to look upon his face and head. Had I not known that God was with me I may have DIED WITH FRIGHT! His head was a Baphomet! It seemed as though he was not even aware I was there UNTIL I saw his face and head! I knew instinctively he hated me with a perfect hatred and would have slain me if he could have. He was visibly angry and furious! Then he reached down by his side and grabbed what appeared to be a huge long spear and with great anger and malice threw it straight up!! It pierced the top of the church and went through the roof and high into the skies!!! I sensed I was not to move or say a word or do anything other than watch and observe. The spear was gone a short time and I then heard the whistling of it coming back down! It came back in and entered back through the same hole it made as it left the roof! I saw it come through the roof and DIRECTLY into the head of the Baphomet and struck him mortally….. killing him INSTANTLY!! I believe this dream is a warning about the antichrist spirit rising as never before, even in the churches, and certainly AGAINST the Saints of God! 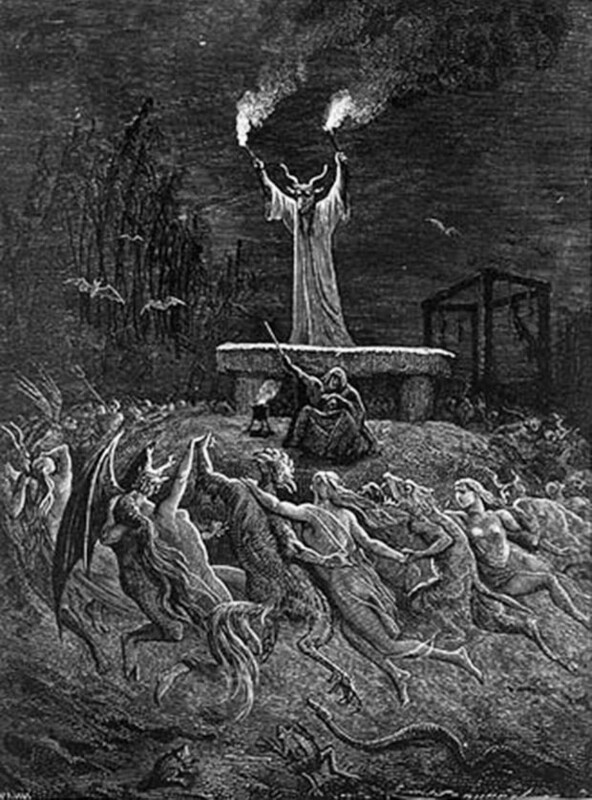 I believe Baphomet standing at the front of the church, facing the congregation and wearing priestly garments, illustrates how the antichrist spirit seeks to replace the true Messiah as the head of the Church. His spear represents his power. Throwing his spear high into the air, piercing the top of the church and continuing into the heavens, illustrates how Satan seeks to exalts himself above the Church and exalt his throne above the throne of God. The spear falling back down through the same hole where it went up through shows his plans will fail as God thrusts him down to Sheol, to the pit, as described in these verses from Isaiah 14. 13 “But you said in your heart, ‘I will ascend to heaven; I will raise my throne above the stars of God, and I will sit on the mount of assembly in the recesses of the north. I was standing before Jesus. Exactly, as I felt in the pit of my stomach a deep woe! It grieves me that so many protestant evangelical leaders are joining with Pope Francis in the ecumenical movement.This is from the pit of hell.There is so much talk about unity.We cant be united in a commen bond with the devil.Have people forgotten that the Catholic Church burned many Christians at the stake in the past because they wouldn’t submit to the Roman church.We need to stand up for the truth these days like men such as John Knox,John Huss etc. I agree Michael. Our own leaders have betrayed us by failing to expose the scheme of the devil working throughout the world through the Catholic Church. We have given Satan a great victory due to our silence and ignorance. The love of money and power has won the hearts and silenced the mouths of many of our leaders. The AC is already in charge of the Church of England and it’s affiliates and the Catholic church through the Jesuit pope, these 2 are a big force in bringing all religions together in the UN. United Religions Initiative was created by Bishop Swing who is the recipient of many honorary doctoral degrees including the Jesuit sponsored University of San Francisco. William Edwin Swing (born 26 August 1936) is a retired bishop of the Episcopal Church in the United States. The Episcopal Church (TEC) in the United States is a member church of the worldwide Anglican Church of England Communion. I can’t remember who was told this but many churches “dance around the golden calf”. Well every church is part of the world council of churches except the Catholic Church. they r the head n who’s who of church leaders have their pictures taken with the pope. I agree the Catholic Church is the head, the Baphomet head. I agree. There seem to be many Catholics who love God and serve Him faithfully, but I think in the years to come, it is going to get harder for them to remain in the Catholic Church because it will be playing a central role in Satan’s end time plans to bring forth a one world religion which will require the whole world to worship the man of sin. My references to the Catholic Church are not intended to apply to all the members, but rather to the Church itself, the institution that has been the mother of all harlots for the past 2,000 years. I believe it is and always has been Satan’s most powerful instrument on earth for advancing his agenda. A big headed Amen from a former Catholic ! A blessed Thanksgiving to All ! I would like to thank you James and all the others here for having the guts to tell it like it is.